Welcome to the Idle Pen: A specialized repertory for periodic oozings of commentary and opinion on the vast world of license plates. Whether for writing up accounts of meets, making deductions about numeric formats or variations, or simply letting off steam; this is the place! When you research license plates and registration systems, you learn and pick up on things that you might not notice otherwise. Heavy truck and trailer plates provide at least as ample an opportunity for this as any other type. The upper letter in the serial formats of most of Wisconsin's truck and trailer plates is a weight code; progressing alphabetically from the lightest ("A") to the heaviest ("T"); with "X" thrown in out-of-order between C and D. Naturally, not all weight classes have equal distribution: Lighter trucks tend to be by and large more common than heavier ones, and indeed the serial progressions for some of the heavier Insert Truck classes have barely budged at all since the numbering last started over in 1994. Conversely, Tractor plates are skewed overwhelmingly towards the heaviest "T" class; which the vast majority of big rigs fall into: I've only spotted two recent tractor plates in use that weren't in the T series, and the serials of "T" Tractor plates numerically dwarf the other series in use. This is a current-series (2009) Insert Trailer plate in the "L" weight class; indicating a maximum gross weight of 50,000 pounds. Although L isn't the heaviest class (M through T still have it beat), this is nevertheless the heaviest class of Insert Trailer plate I've seen so far, and the serial belies that: The number of the plate is LR 979; which becomes significant when you consider that less than a thousand numbers in the series have been issued since the numbering began over fifteen years and two reissues ago. Moving from the uncommon but explainable to the downright inexplicable, I was genuinely excited to come upon this registration artifact today: An older (and well-knackered) Special-Z plate in the 20,000 pound "F" weight class, spotted on a flatbed vehicle trailer. But, just what the heck is "Special-Z" supposed to mean? The Wisconsin DOT guide says nothing on the topic. The April 2001 ALPCA newsletter describes the type as "special seasonal equipment;" which doesn't get us much farther. The only other description I can come across is from a defunct collector website; which summed up the category as thus: "Special Z plates are used on miscellaneous heavy vehicles such as circus trucks." It's anyone's guess how a prosaic flatbed trailer qualifies; or why they chose the letter Z for the purpose...and I'm not even going to begin to worry about the Special-UX class; which seems to be more or less the same thing. Regardless of what Special-Z plates are issued to, however, they're a rare find...even moreso since the type was discontinued in 2004 and heavy vehicle plates were reissued last winter. This is the only Special-Z or Special-UX plate I've seen in use since beginning my Wisconsin plate-spotting project a year ago, and I don't expect to come across another one any time soon. I'm not sure whether the Special-Z series started at 1 or 1001 (WI offers no predictability on that note), but it's a pretty low number in either case. The 1967-86 era of Wisconsin license plates is a veritable goldmine for minor die and stamping variations. Last time around I focused on the "crude die" variation of the 1973 base, but this is hardly the extent of the varieties that exist. Some of these include slightly-different forms and proportions of the state name, slogan, month abbreviation, and serial character dies; although these tend to be so scattered in distribution that I won't even start worrying about narrowing them down beyond rough approximations. A feature that isn't scattered, however, is the series of "groove and slot" stamping variations toward the end of the 1980 base's run. In due course, these features disappeared. The lower right "keyhole" slot was first to disappear; replaced by an ordinary bolthole by August 1984. The next change happened in 1985: In preparation for the upcoming graphic base, the debossed border on Wisconsin license plates was replaced by a beveled "step" edge, and the groove below the slogan was removed. This proved to be the last change until the yellow plates were succeeded by the graphic issue in August 1986 (although a few yellow plates were remanufactured as replacements even after that). Natural 1986 and 1987 expirations can appear on both of these late variations. These are the "groove and slot" variation cutoffs for each month series that I've observed so far. As always, I'd be curious if any reader happens to have a plate on hand that might narrow things down even further! 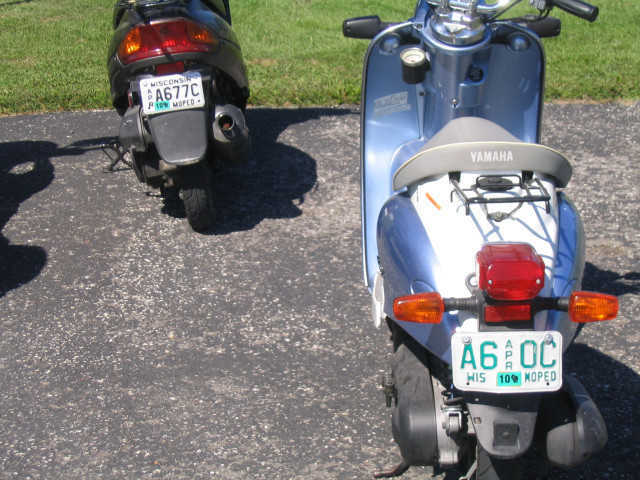 Here's an interesting sight I happened across today: Two moped plates in completely different "A-C" series. Since the current series began in 1992, Moped plate numbering has progressed through the 12 34, A1 23, 12 3A, and A1 2B formats. The switch from the oversized green-on-white plate design to the smaller black-on-white issue came in 2003, starting (allegedly) in the F-A series. A123B is the newest format, starting in 2009 after the four-digit formats were exhausted. Number A677C is actually the first plate I've seen in this configuration on the road. Moped plates are fairly common in Wisconsin. Most any small motorbike with an engine displacement of 50cc or less qualifies for them. Once in a while, you might come across a 1973-base Wisconsin plate that looks a little "off." It's not your imagination: The state was using two different die sets during this period. Plates using the "normal" die set were produced using a matched male and female pair, resulting in crisp stamping. This is the fashion in which most 1973-base plates were made; as well as all plates on bases since. The alternate die set (or "crude" die set) had a slightly different production method: Only a single male set of serial dies was used; impressed into a block of rubber or similar material. With no female die to maintain the shape of the character on the opposite side, a gradual tapering is present to the metal surrounding the imprinted characters. In addition, these plates invariably feature a somewhat messier and globbier paint job on the letters and numbers. The alternate dies contain a few differences in form as well. While the "normal" dies of the period used a curved "7" and short bowl for the "5," the alternate dies employed a straight-line "7" and somewhat longer bowl in the "5." These design features would later reappear in the normal die set during the 1980s. The crude dies made appearances on a few non-passenger plates as well. So far, I've noticed them on late-period 1970-base light truck and farm truck plates, and on literally every 1974-base light truck plate I've seen not in a stacked-alpha overflow format. Oddly enough, I haven't seen any 1974-base farm truck plates with the crude dies; although that's not to say that they couldn't be out there. What to collect? That's probably the question that most anyone interested in license plates as a hobby has asked themselves at one time or another. Certainly, it's a sentiment I can relate to...since I've been shifting and fine-tuning my collecting interests for as long as I've been collecting plates. Of course, it's a bit of a stretch that I've had a coherent "collecting plan" for very long. In the years before I joined ALPCA and began attending swap meets, I really didn't go out of my way to find plates. Thus, I was bound to be satisfied with most anything that sympathetic friends or relatives could procure for me; chips falling where they may. Some collectors continue the "anything goes" mentality for some time thereafter, but no one can (or should) collect everything. So, how to narrow things down? When I started narrowing down my collecting interests, I had two major focuses in mind: A birthyear run, and a home state run...which in my case was West Virginia. For WV, my collecting plan was relatively simple: Put together a passenger run of the years encompassing the graphic base from my childhood; collect a representative example of as many non-passenger types on that base as I can, then start slowly working my way backward and forward from there towards accumulating a well-rounded collection of dates and types from throughout the state's registration history. My progress was a bit tempered by the overinflated values of West Virginia plates on the collectors' market (low population, single plates, and YOM will do that), but it was a sound enough plan. When I moved to Wisconsin a year ago, it was inevitable that my collecting interests would eventually drift to that state. This proved to be fortuitous, since I had had a mild interest in Wisconsin for some time: Certainly few states have had quite as much variety in colors, variations, and types over the years. But as interesting as variety is, it proved a bit of a bane in another matter: What to collect? To cover all of Wisconsin's type, color, and variation combinations would involve an insane number of plates. Where and how should I narrow things down? For West Virginia, I had approached the "map" base as a comprehensive starting point to a collection and as a "set" to complete: It was issued for 19 years with clear divisions between the series before and after, and all non-passenger types apart from motorcycle and government were made on it as well. It was harder finding a similar analogy for Wisconsin: They've essentially had only one graphic design over the years. Only some non-passenger types have been produced on the base, and many of these types had no relation in design to passenger plates until the 1990s; further reducing the variations involved. So compared to my earlier homestate, a graphical type set for Wisconsin didn't seem nearly as appealing a prospect to complete...and many of the most intriguing plate types weren't on the graphic base to begin with. In the meantime, I started scouting out as many license plate pictures as I could; trying to look for patterns and piece together as much information about Wisconsin's confusing varieties as I could. Then it dawned on me: Why not do a "cross section" run of Wisconsin non-passenger types from my birthyear? Such a project would fit into my existing collecting focuses, and expose me to an excellent sample of the variety I had been witnessing in my research: 1985 passenger, light truck, heavy truck, light truck for hire, motorcycle, dealer, and dual purpose vehicle plates all bore different colors, and many types even employed different colors for validation stickers as well. Some types of the era had debossed borders while others were embossed and painted. Permanent plate types of the era such as Municipal and Collector offered the further wrinkle of still more color schemes and varieties on hand, for a grand sum of what had the potential to be a very intriguing set. So, it seems that one particular spot is where my Wisconsin collection is headed at the moment. I've also pieced together a partial passenger run, and have a few interesting plates here and there that don't fall into other categories. While for now the images are scattered amongst the other found and taken photos in my Wisconsin research pages, I may devote a page specifically to my Wisconsin plate collection in due course!